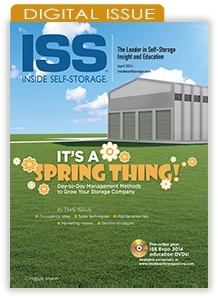 The Inside Self-Storage April 2014 issue explores issues of day-to-day facility management, focusing on the tasks managers must master to succeed, including marketing, sales, maintenance and customer service. For self-storage managers, every day has the potential to be unique. The responsibilities of managing a successful facility are varied and complex. Today you might be focused on social media efforts. Tomorrow could be dedicated to landscaping duties. Regardless of your to-do list, every day includes key interactions with customers. This issue explores the diverse facets of daily facility operation, including the tasks every manager must accomplish and master to be successful: sales, customer service, marketing, site maintenance and more. The danger of "authorized access"